This is excellent advice. But, why? In the midst of all the business changes that are happening, it is imperative to incorporate another form of learning. E-learning is a valuable addition to a company’s existing training strategy because it will enhance your employee’s performance even further. Computer-based training programs provides a great platform for workers to learn by “doing.” Simulations can be created to walk a surgeon through a procedure, guide a welder safely through brazing, and quiz an accountant on the new bookkeeping software. This gives employees the opportunity to make and learn from their mistakes in a safe environment. Digital technology offers “Just in Time” training opportunities, which provides the resources employees need to be the most effective while on the job. If you were rolling out a new process, consider the impact a short video tutorial could have on the knowledge retention and overall success of the process implementation. “Just in time” learning coupled with “learning by doing” multiplies the results when it comes to knowledge retention. 33% of today’s workforce is between the ages of 18 and 34 and as we know all too well this group is hooked on technology; This isn’t necessarily a bad thing, but employers need to get creative in how they engage this generation. With over 80% of Millennials wanting a flexible work schedule, we shouldn’t be surprised that they want to learn on their own time. Providing an avenue where they can access the learning they crave (and need) on their own time will help them become more engaged in the learning. So whether you call it e-learning, computer based training, or virtual education, just make sure your company offers a self-paced, easy-access training opportunities for all employees. It makes a difference because the more you know, the better you do. 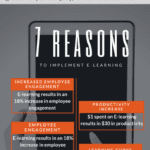 Have questions on how your organization could benefit from eLearning? Contact us! We’d love to help.